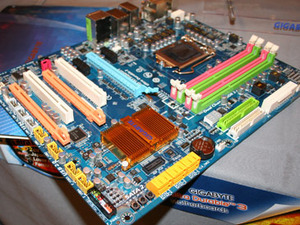 CeBIT 09: We got a sit down with bit-tech friend, Leo Chu from Gigabyte, Manager for European Sales, who snuck us a look at the latest P55 board due to arrive in Q3 with live demo’s due at Computex. The layout is quite similar to the MSI P55 board we saw earlier in the week – there is plenty of space around the CPU socket and the southbridge gets just a little cooling. Interestingly, the southbridge has now (finally) gone flip-chip with the silicon package directly exposed to the heatsink. 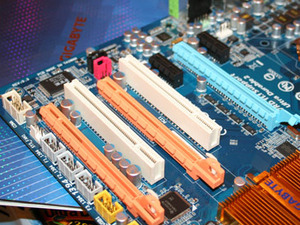 CPU power use is actually less than MSI’s, which is a strange twist from the norm – Gigabyte see fit to only introduce eight phases around the new CPU socket, with an extra phase to the four DDR3 sockets (one of which is pink! ARGH! We hope that changes). As with the MSI, the rear I/O features DVI, HDMI and VGA but the two black squares right the rear I/O might suggest, yet again, that Intel has left the digital TDMS for Gigabyte (or whoever else) to figure out. It would appear Intel still lags behind ATI and Nvidia by not including it on-silicon. The slot layout is good, although we can clearly see what four 16x slots really gets us in terms of PCI-E lanes: 16x, 8x and an 4x. P55 will support CrossFire and SLI, which will run fine over two PCI-E 8x slots, but three-way multi-graphics using a PCI-E slot with 4x lanes isn't, in our experience worth it at all. That said, while not good enough for gaming graphics, PCI-E 4x is fine for other high performance add-in cards. Generally the Gigabyte's port layout is good and although this model is currently lacking eSATA, there will, as usual, be many, many different versions. 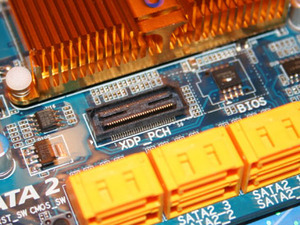 We asked Gigabyte what the XDP_PCH socket by the Southbridge was and were told it was Intel’s new connector for a new feature “like TurboBoost”. We’ll have to enquire further about that one with Intel. EDIT: Apparently it's a debug port, so we'll not see it on the final products. Gigabyte’s only new releases in the next six months will be models that readdress the budget and mainstream market – all designs, we were told, will be moved to Ultra Durable 3, and so include 2oz copper PCB, dual BIOS, and solid capped capacitors. Gigabyte explained that while this will create a price premium products in price sensitive markets, it believes it's worth it to underline its credentials as a quality brand. The message Gigabyte wants to portray is that all of its products will be reliable for the long term and feature stable BIOSes, with strong features and peripherals to back-up the price. 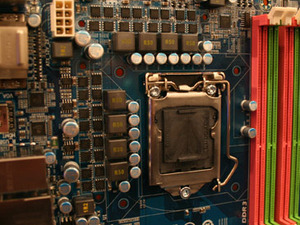 COMPUTEX 09: We grab a couple of shots of the pre-production Core i5 CPU in BIOS and in-Windows! COMPUTEX 09: We get some first shots of ECS' upcoming P55 live-demo due to be shown at Computex next week. COMPUTEX 09: We've had multiple confirmations that Intel's next generation platform will be available to buy from Sept 1st.